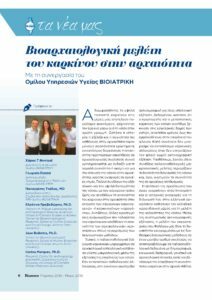 Our PBP research project on cancer in antiquity is featuring in the News of the Biomedicine Group (Βιοιατρική). We are grateful to Carina Marques for joining our team and for leading the cancer project. 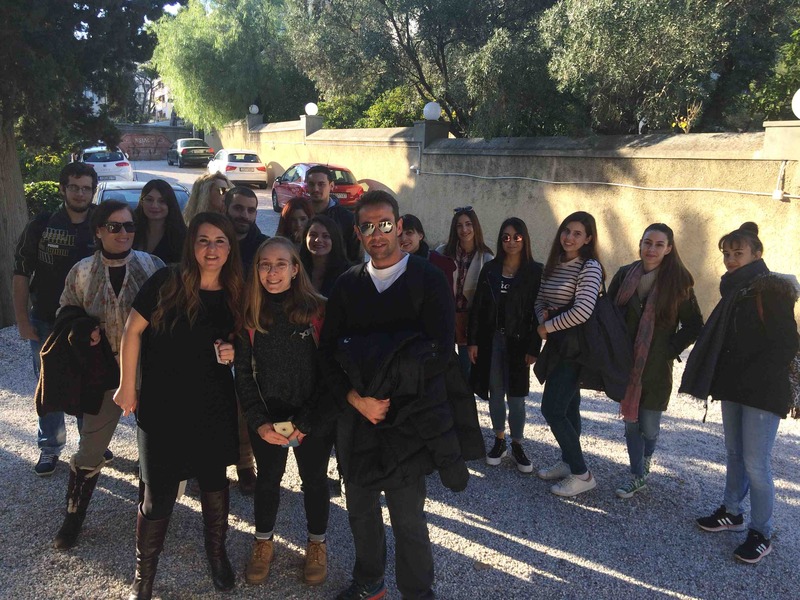 We want to thank Charis Fontrie, Georgia Pappa, Panagiotis Toulas and all the Biomedicine staff for a wonderful collaboration. We look forward to continuing working with you! Nowadays, high cancer frequency and cancer-related mortality are global phenomena, however the history and evolution of the disease in the ancient past are controversial matters. Questions arise as to whether or not the apparent low frequency of archaeological skeletal examples is artificial due to methodological challenges in our paleopathological diagnostic methods. 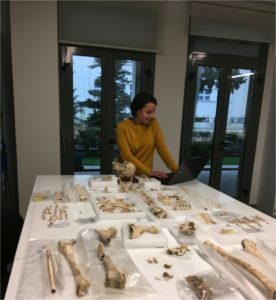 Focusing on the large and diverse skeletal sample from Phaleron we systematically screen for cancer-related skeletal finds through digital radiography in addition to macroscopic observations in collaboration with the Biomedicine Group. 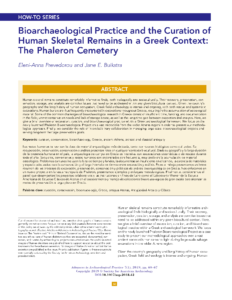 Our paper on PBP and the curation of the Phaleron skeletal remains just came out on a special issue in Advances in Archaeological Practice. Thanks again to Carolyn and Katie for organizing the wonderful session in the 2017 SAAs. All contributions are worth reading. Congratulations! In Athens, of course! 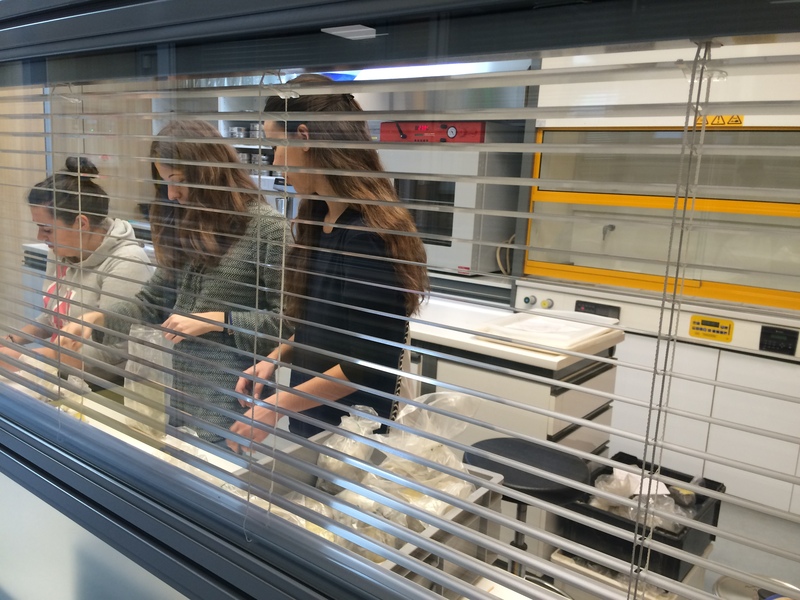 Jane, Eleanna, Aliya, and Hannah contemplating over a skeleton at the stury area of the osteology lab at the Wiener Laboratory. What fun! PBP is growing and expanding! We are very fortunate to have new members in our conservation team. Foteini Diatsigkou (our former intern) and Lefteris Kosmidis just joined our professional conservation crew. Growing in numbers came with expanding in space. 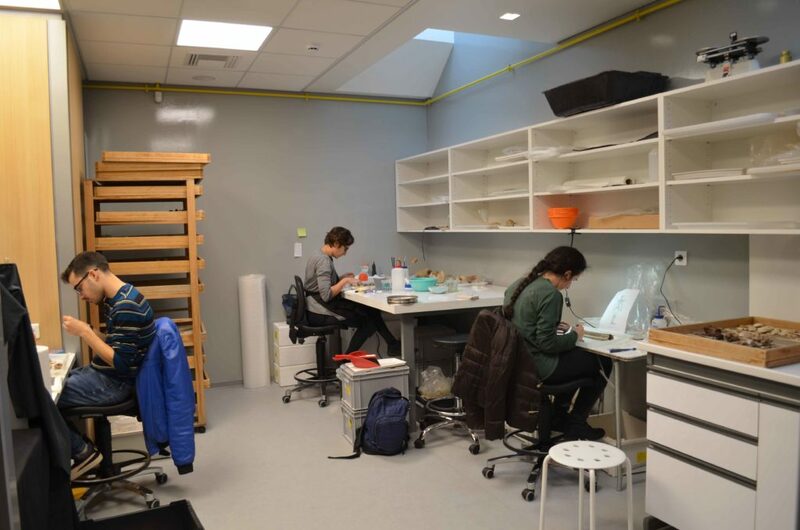 The “old” lab space at the ASCSA is revived and converted into our conservation laboratory along with storing the hundreds of crates with the Phaleron skeletal remains. This way we are able to work on the large soil blocks without having to move them. Anna and Foteini in action! Lefteris and Panagiotis in action! Hannah Liedl just joined our team! 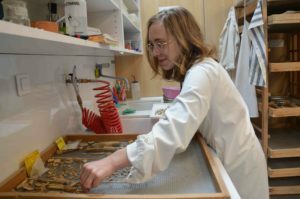 She was awarded a 6-month fellowship from the Austrian Academy of Sciences to work on the Phaleron Bioarchaeological Project at the Wiener Laboratory. 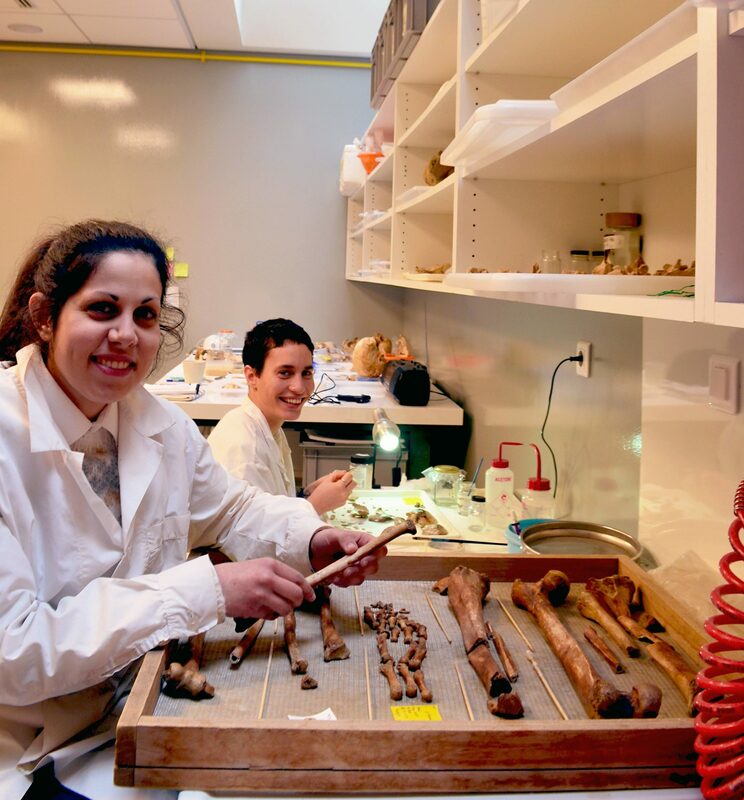 Here, she is recording pathological changes on a skeleton from a pit burial from Phaleron. Jane Βuikstra came back to Athens to begin our fall season! 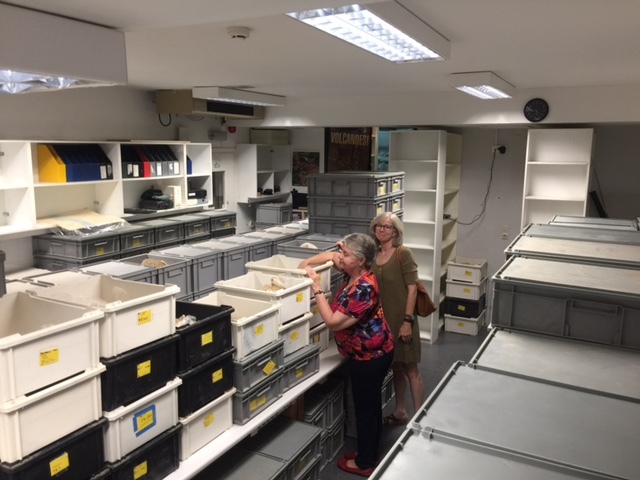 Here at the storage facilities of the Ephorate of Piraeus and Islands while examining the fettered legs en bloc from the mass grave of four young men discovered in 2013! 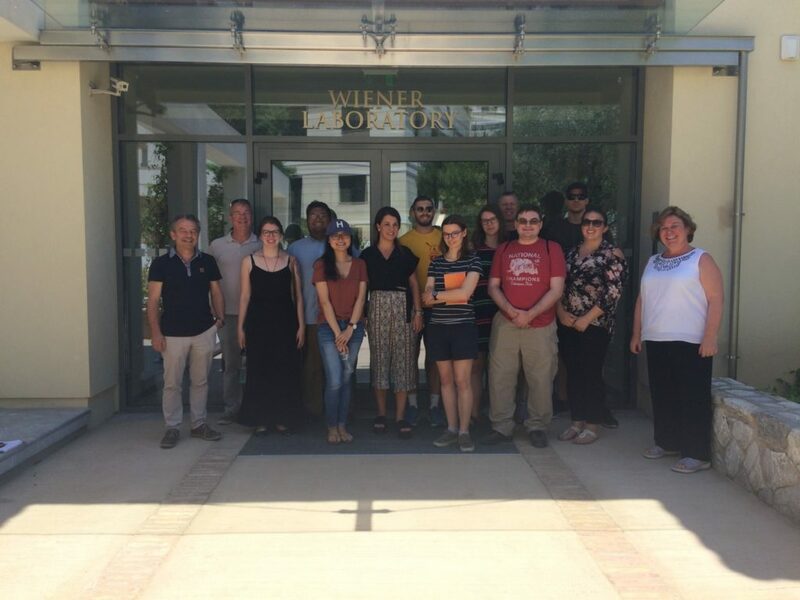 What is a summer at the American School of Classical Studies at Athens without a Summer Session seminar at the Wiener Lab! Here, Takis Karkanas and Eleanna Prevedorou with the wonderful group led by Prof. Georgia Tsouvala on a hot summer day following a “cool” visit at the new Wiener Laboratory. Welcome on board Jessica and Foteini! 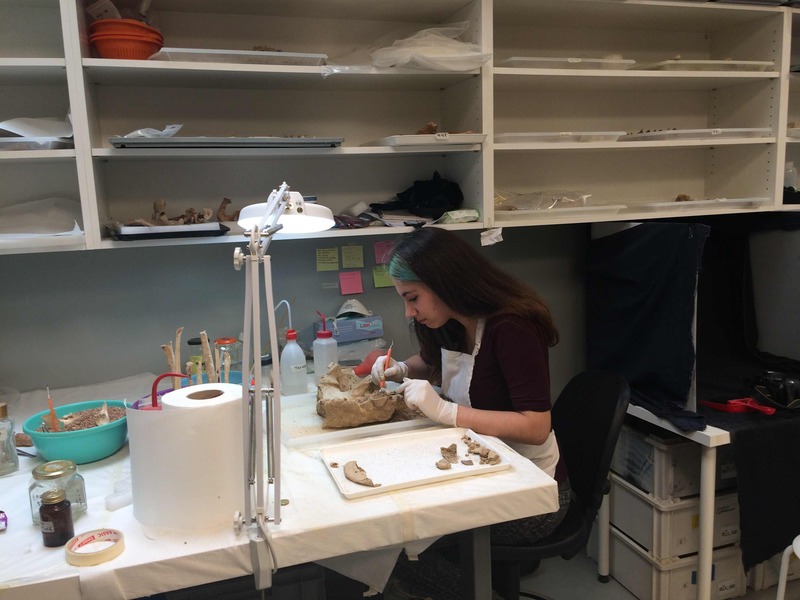 Jessica Rothwell (PhD student, School of Human Evolution and Social Change, Arizona State University) is starting her dissertation on the jar burials and juvenile remains from Phaleron focusing on issues of health, diet & survival, and childhood identity. 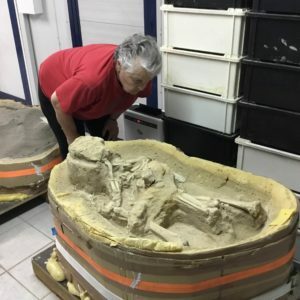 What a better way to familiarize herself with the preservation of the Phaleron skeletal remains than microexcavating a skeleton! At the back, you can see Foteini Diatsigkou, our new conservation intern from the Vocational Training Institute Petra and Zografou. 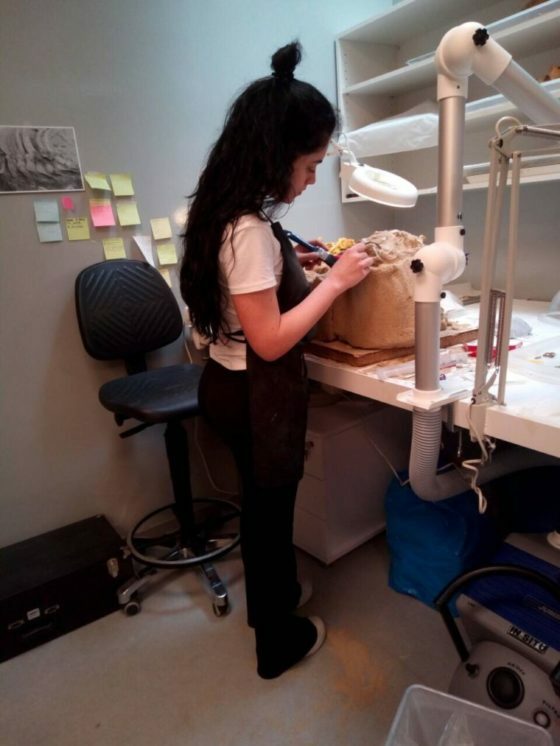 Phoebe (Foteini) Papasotiriou, our new conservation intern from the Vocational Training Institutes Petra and Zografou, has also experience in conservation of art work. 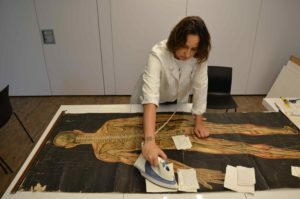 During her internship, she helped us conserve vintage human anatomy posters we found in the archives -now up on the Wiener Lab walls. Thank you Phoebe! 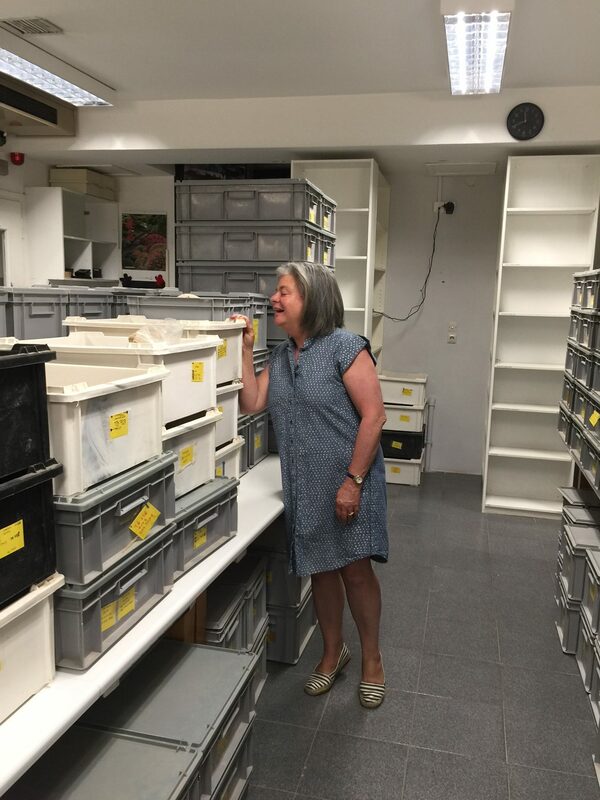 Project Director Jane Buikstra travels to Athens frequently for the needs of PBP. 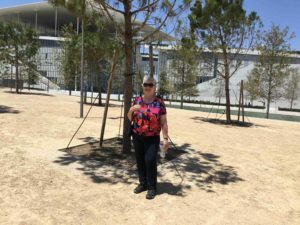 Here while looking for some shade at the Stavros Niarchos Foundation Cultural Center after visiting the skeletal remains from the large mass grave of 2016 that remain in situ at the Phaleron site. Let the summer season begin! 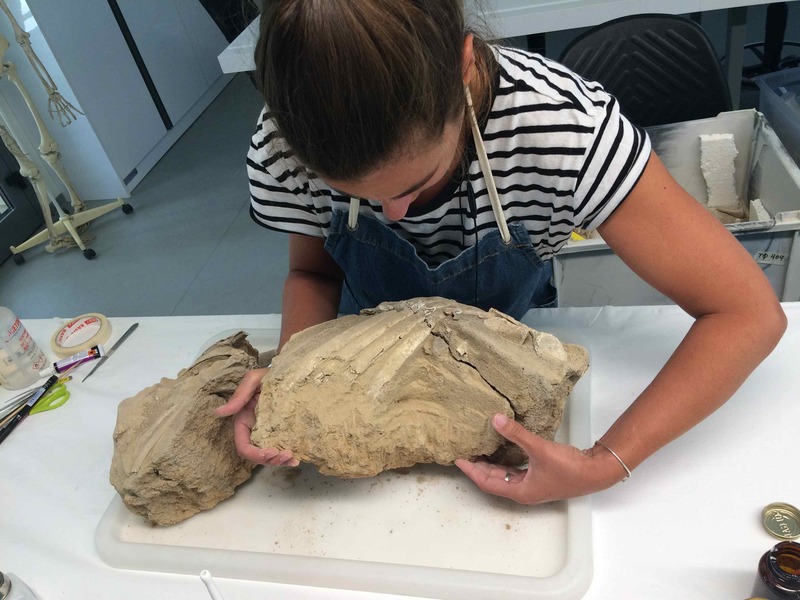 Our conservator Anna Lachana working on a torso from a pit burial removed within a large soil block. It takes time, patience, and skill! Following the microexcavation of the block, the skeletal remains are cleaned and conserved in detail, while all soil is dry and wet sieved. 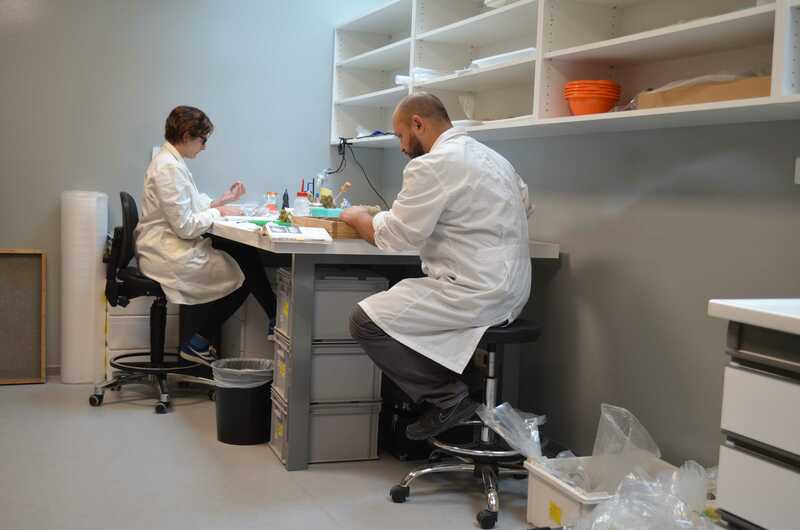 We have a strict protocol of keeping selected specimens untreated, so that we can ensure biochemical analysis. 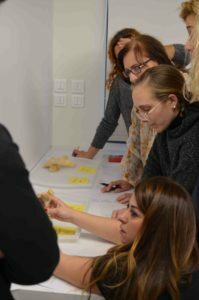 The graduate students in Archaeology at the National and Kapodistrian University of Athens return to the M. H. Wiener Laboratory for a seminar on the lab’s facilities, current research, and the Phaleron Bioarchaeological Project by Eleanna Prevedorou. Here is a photo along with our PBP conservation team! Flint Dibble, the faunal specialist working on the Phaleron horse remains, is giving a seminar on archaeozoological research. You never know when you may have to take an animal bone quiz! 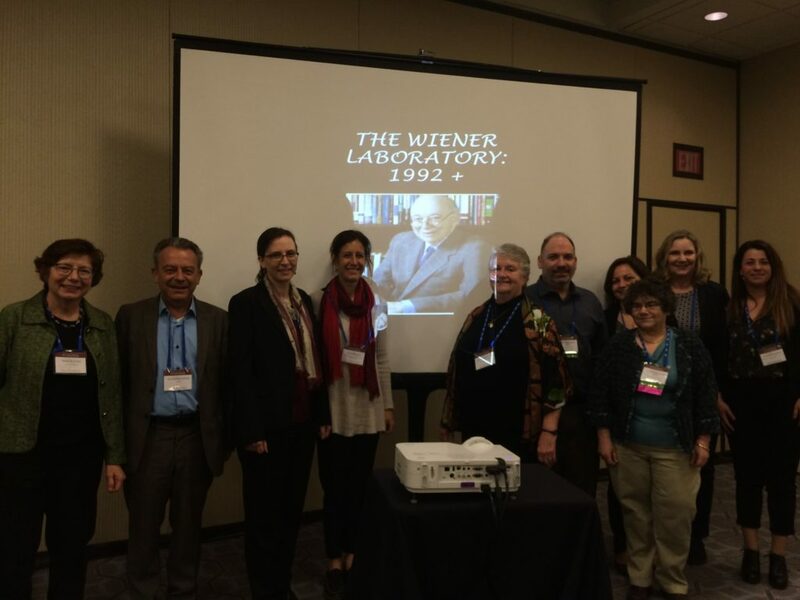 M. H. Wiener Laboratory Session “Archaeological Science Meets the Classics: Emerging Knowledge in the Ancient Eastern Mediterranean World” (organizers: Eleanna Prevedorou & Calla McNamee) at the 83rd Society for American Archaeology Annual Meeting. Lovely reunion, great talks, and exciting research! Warm thanks to all participants for a wonderful session! 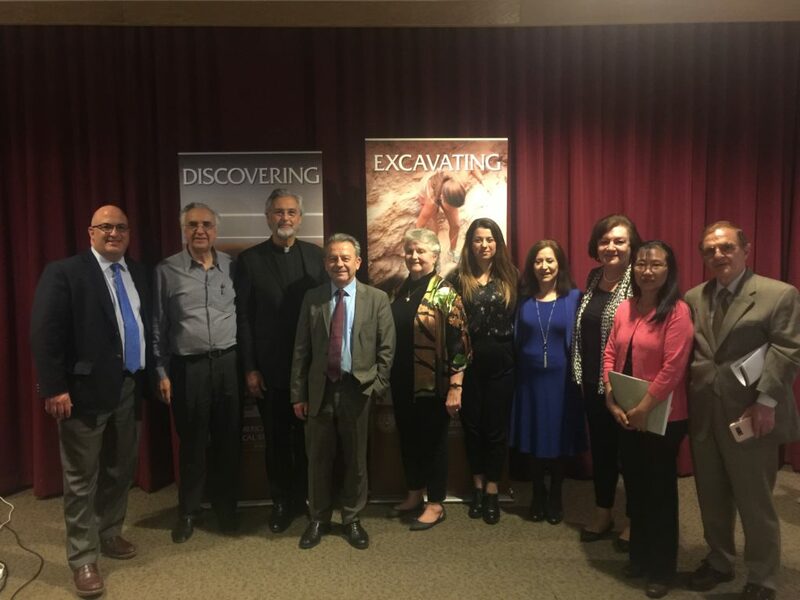 Right after our SAA session, Jane Buikstra, Takis Karkanas, and Eleanna Prevedorou along with George Orphanakos had the joy to present the work of the M. H. Wiener Laboratory and the Phaleron Bioarchaeological Project to the Hellenic Society Prometheas at St. George Greek Orthodox Church at Bethesda MD. 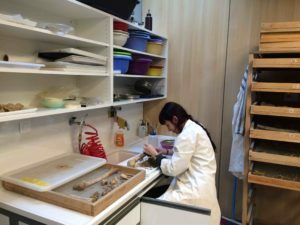 Hikaru Fujii at the Wiener Lab: The art of science! History and archaeology inspire art! We were fortunate to have Hikaru Fujii and his team at the Wiener Lab filming The Primary Fact, for the Onassis Fast Forward Festival 5 (Onassis Cultural Centre, Athens). It was great fun, as well as an amazing experience to be part of art in the making and to collaborate with such a wonderful crew. 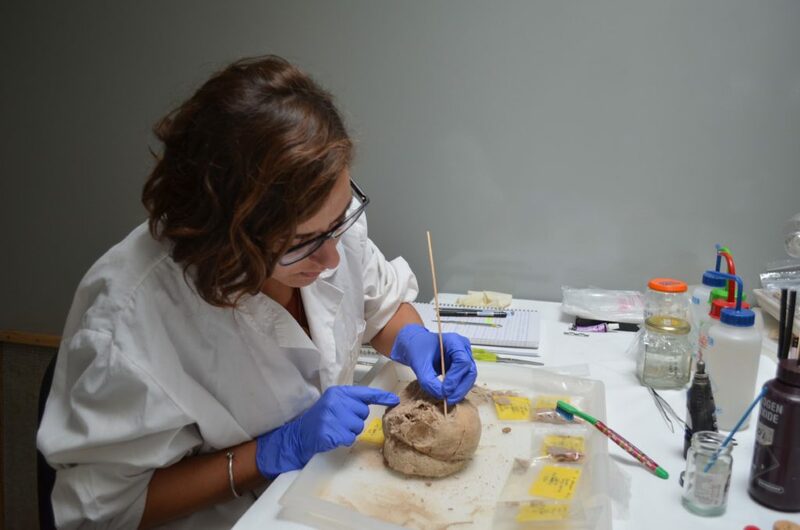 Here is how photographer Thanos Lazopoulos captured our conservation work on the Phaleron remains through his artistic lens and we thank him for sharing this shot with us: our conservator Anna Lachana using the ultrasonic dental scaler to remove the thick crust from a cranium. 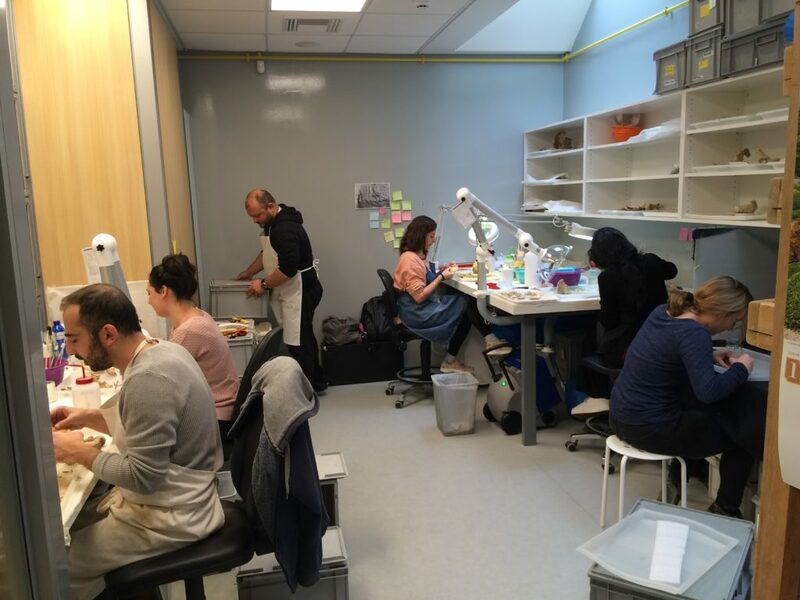 Let us welcome with great joy conservators Eirini Stathopoulou and Anna Lachana working along with Panagiotis, Thomas, Zoe, and Anastasia! Such a great team! 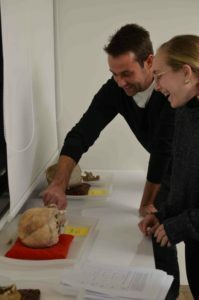 Eleanna holding a Wiener Lab seminar and hands-on workshop on Bioarchaeology and the Phaleron Project for the Regular Program of the American School of Classical Studies at Athens along with Lukas Waltenberger (left). Many thanks to Cindy Levesque (right), our new graduate intern coming all the way from Canada, for her help! 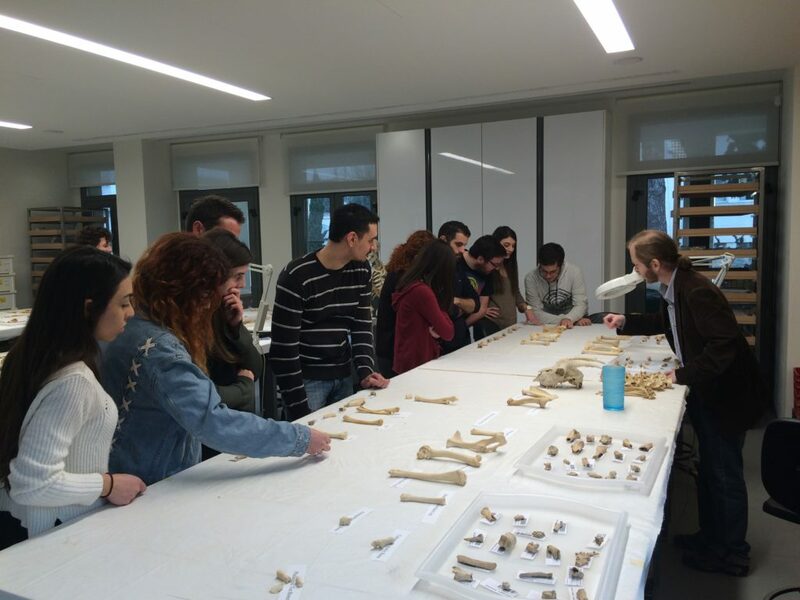 The students of the Graduate Seminar in Mortuary Archaeology of the National and Kapodistrian University of Athens are visiting the Wiener Laboratory for Archaeological Science of the American School of Classical Studies at Athens for a hands-on session in Bioarchaeology by Eleanna Prevedorou: human osteology, sexing skulls and pelves, measuring juvenile long bones for age-at-death estimation. 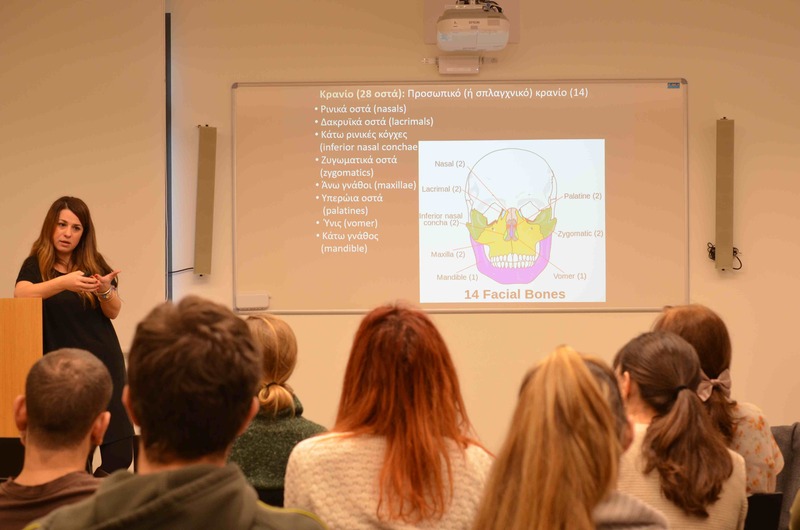 Feel the thrill of a bone workshop! 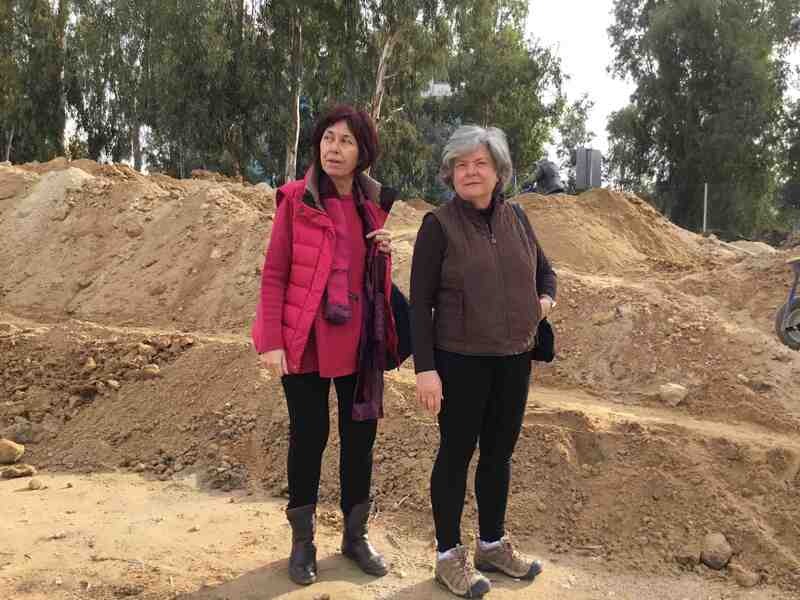 Stella Chrysoulaki and Jenifer Neils looking at the excavation site at the Stavros Niarchos Foundation Cultural Center. 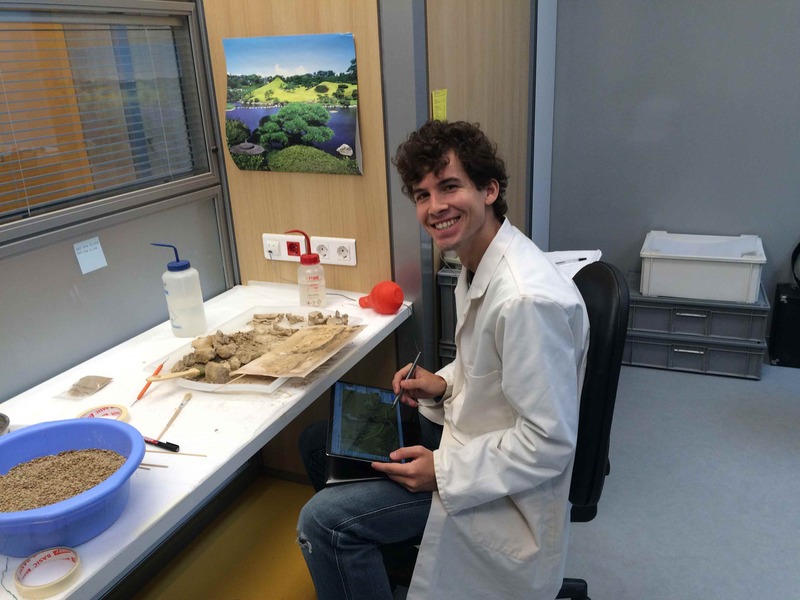 We are welcoming PhD student Lukas Waltenberger who won a 6-month scholarship by the Austrian Academy of Sciences to join the Phaleron Bioarchaeological Project research team. Lukas is working on the skeletons buried in cist graves. Here, he is taking sophisticated notes on burial position using photos and drawings while excavating a thorax block -see how fun bioarchaeology really is? 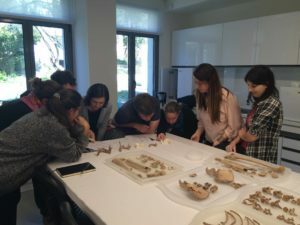 Selected skeletons from the large mass grave recovered at the Esplanada area at Phaleron in 2015 were removed and transferred to the Wiener Laboratory for curation and study. 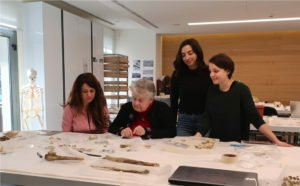 Photo from left to right: Tatiana Panagopoulou (Head conservator, Ephorate of Antiquities of West Attica, Piraeus and the Islands), Varvara Giannakena (Conservator, Ephorate of Antiquities of West Attica, Piraeus and the Islands), Eleanna Prevedorou (Phaleron Bioarchaeological Project Coordinator), Zoe Chalatsi (Phaleron Bioarchaeological Project Conservator), and Dimitris Michailidis (M. H. Wiener Laboratory Coordinator). Great start! Our conservator Zoe Chalatsi repositioning the rib cage of a skeleton before excavation. 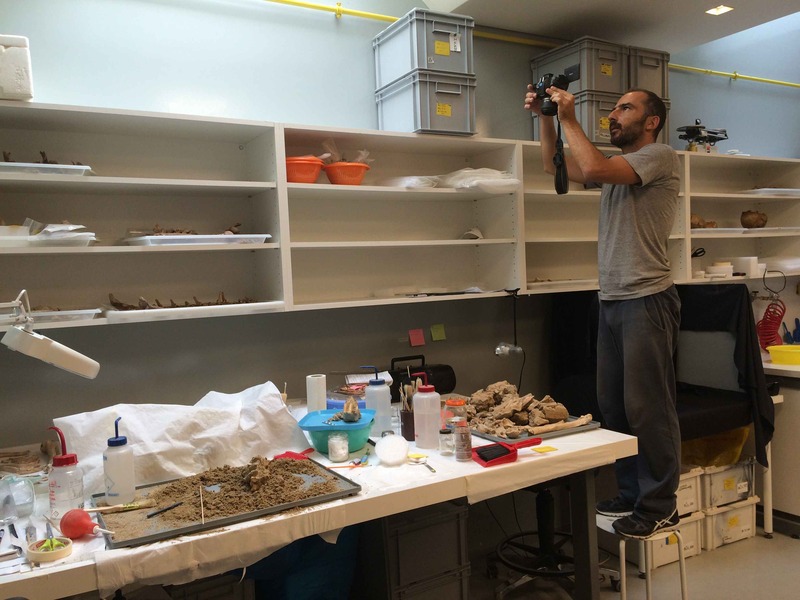 Our conservator Panagiotis Papavasileiou taking photos during excavation of a torso. 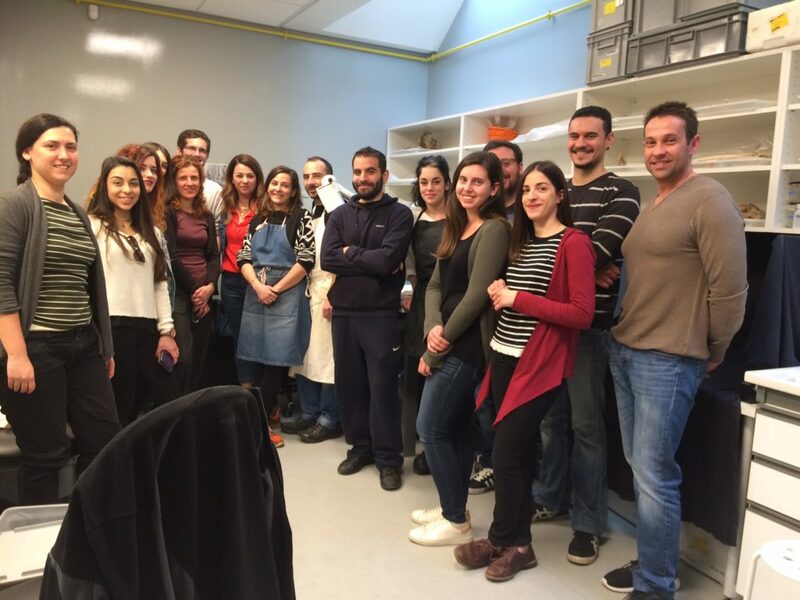 We welcome Iliana Argyriadi, senior at the Vocational Training Institute Petra, who joined us for her 6-month practicum. 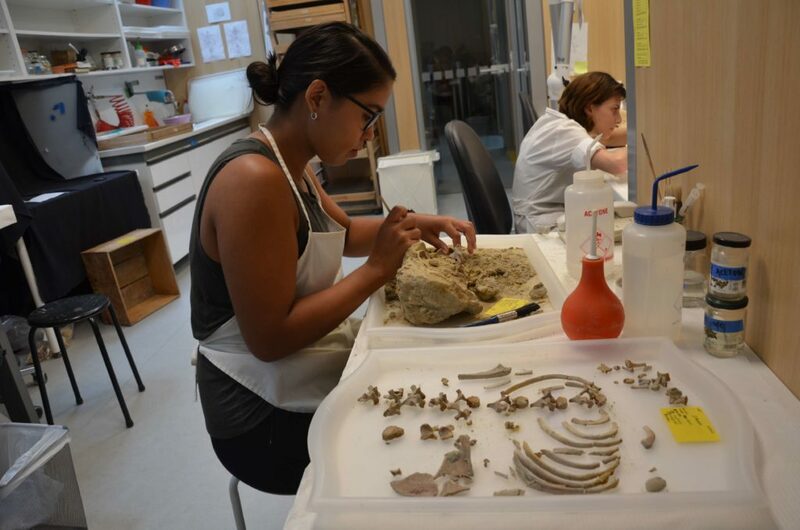 Here, Iliana is excavating a soil block with a pelvis from a pit burial from Phaleron. Our conservation team is growing! Petros Zimperdikas (left), senior at the Vocational Training Institute Petra, will be with us for his 6-month practicum in conservation of antiquities. Panagiotis Papavasileiou (middle) is a conservation technician and a new addition to our staff. 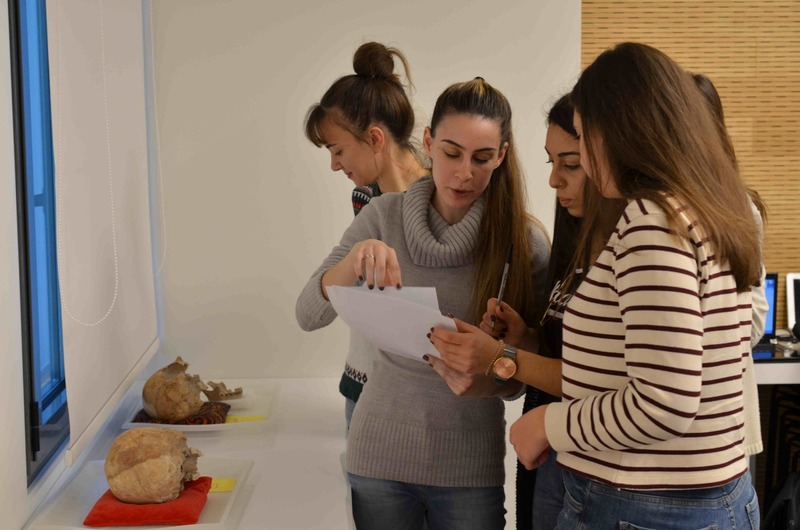 Ioannis Mpraziotis (right), conservation technician, joined our team of interns to be trained in conservation of archaeological skeletal remains. Welcome everyone! 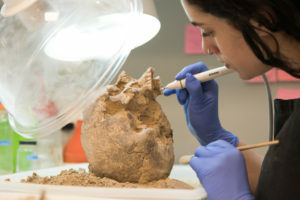 Aliya Hoff (PhD student, School of Human Evolution and Social Change, Arizona State University), is starting her dissertation research on the Phaleron human remains. Here Zoe, Aliya, and Eleanna in action! Great session, wonderful people! 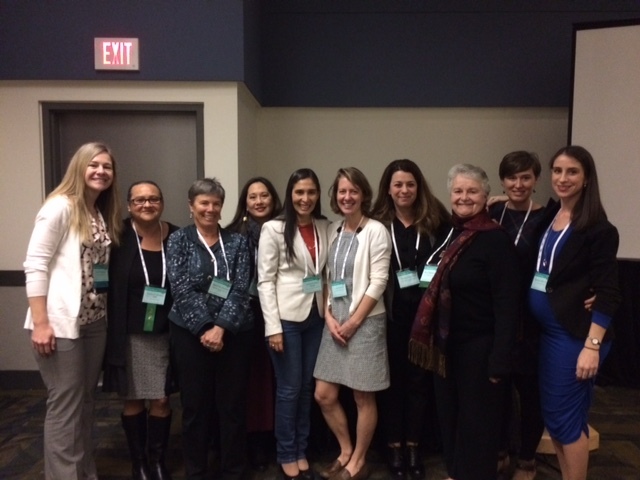 Jennifer Newton, Patricia Powless, Harriet “Rae” Beaubien, Christine Lee, Martha Palma Malaga, Carolyn Freiwald, Eleanna Prevedorou, Jane Buikstra, Anna Novotny, Katherine Miller Wolf (left to right). 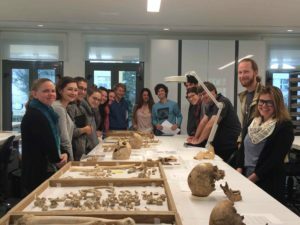 Thank you all for your interest on the Phaleron Bioarchaeological Project! 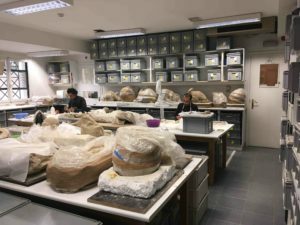 Fernando Bentué Martínez, is a student in Conservation and Restoration of Cultural Heritage at the Universidad Complutense de Madrid, currently doing his study abroad at the Technological Educational Institute at Athens. 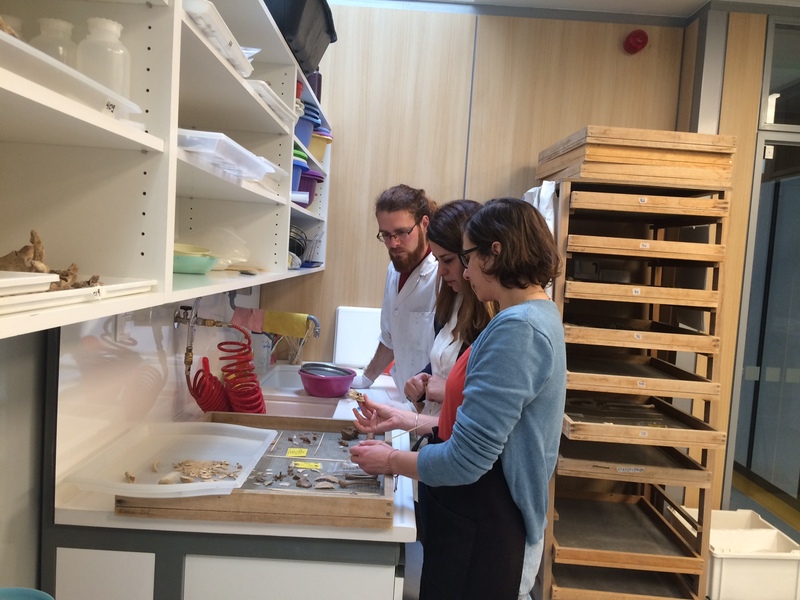 Here is Fernando’s first day working on the infant remains from jar burials under the supervision of Eleanna and Zoe. New members in our team! 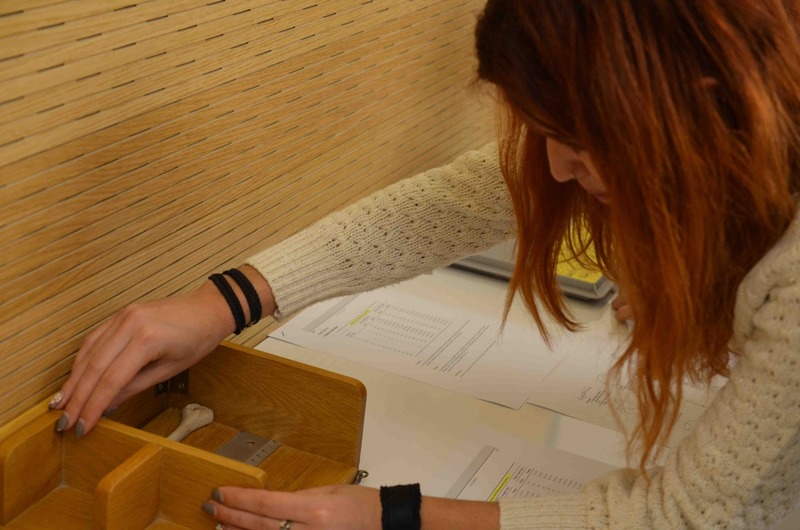 Marialena Andrikopoulou, Eleni Neofytou and Matina Papasarantou, seniors at the Archaeology Department, University of Athens, cataloging and photographing cremation burials. 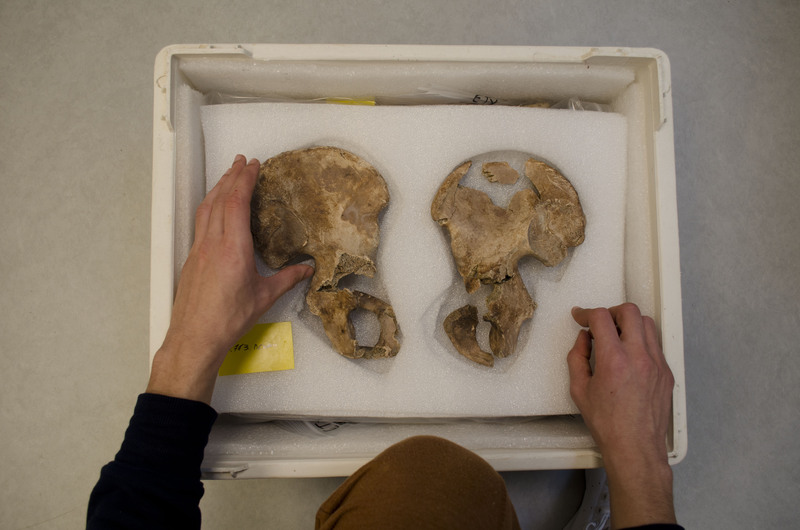 Conservation of the deviant burials has began. Here Zoe working on a skeleton found in a mass burial with the hands tied at the back. Note the development of the muscle attachments at the nuchal area at the back of the skull -very robust! 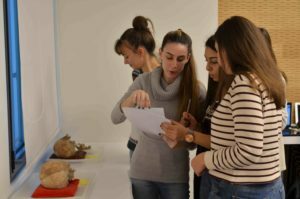 Marianna Manali, a graduate of the MSc program in Bioarchaeology and Forensic Anthropology at UCL, and Aliki Giannikou, a conservator and a recent graduate of the Department of Archaeology, University of Ioannina, just joined our wonderful team of volunteers! 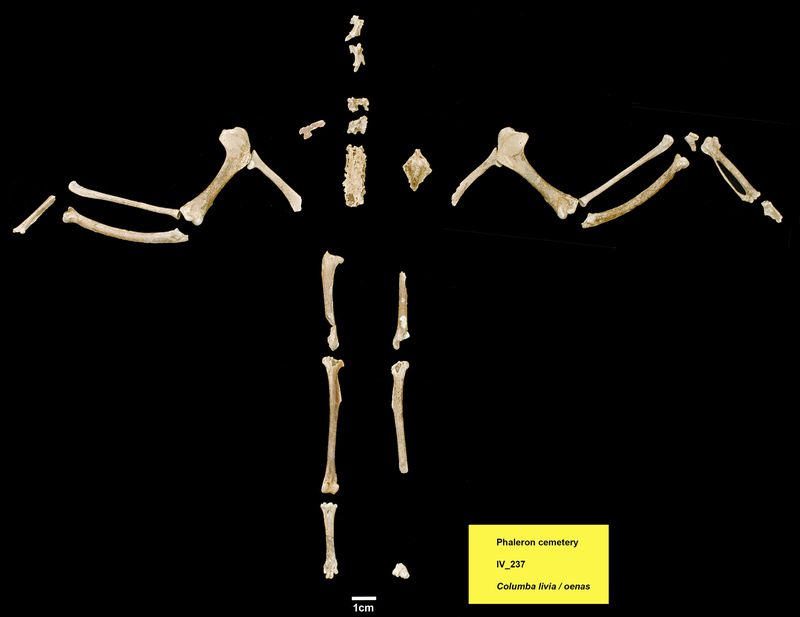 Skeletal elements of a dove were identified with the human remains of a young infant buried within a jar at Phaleron cemetery. Many thanks to the Wiener Lab Coordinator Dimitris Michailidis (paleoornithologist) for his contribution! 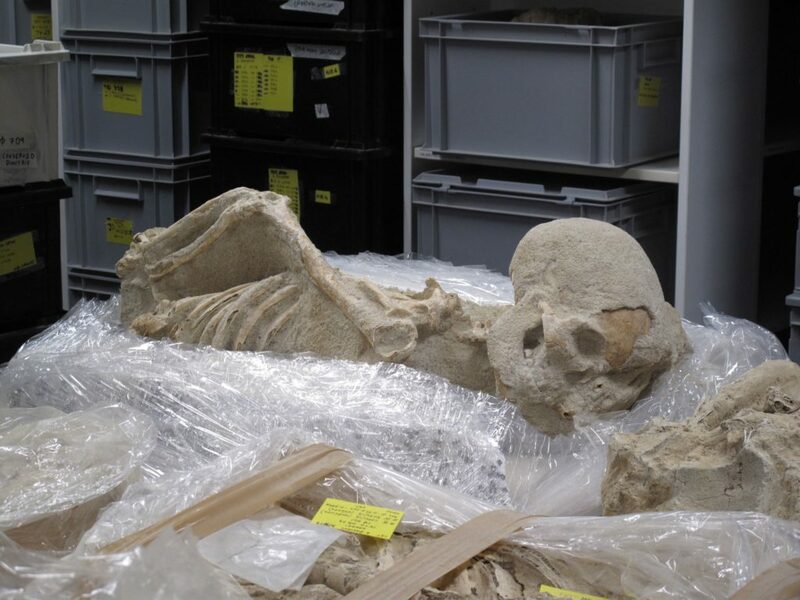 One of the skeletons from the Phaleron mass burials preserving the arms tied at the back at the Wiener Laboratory storage area. Storing the os coxae in ethafoam sheets during the curation process. Conservation never ends at the Wiener Lab. 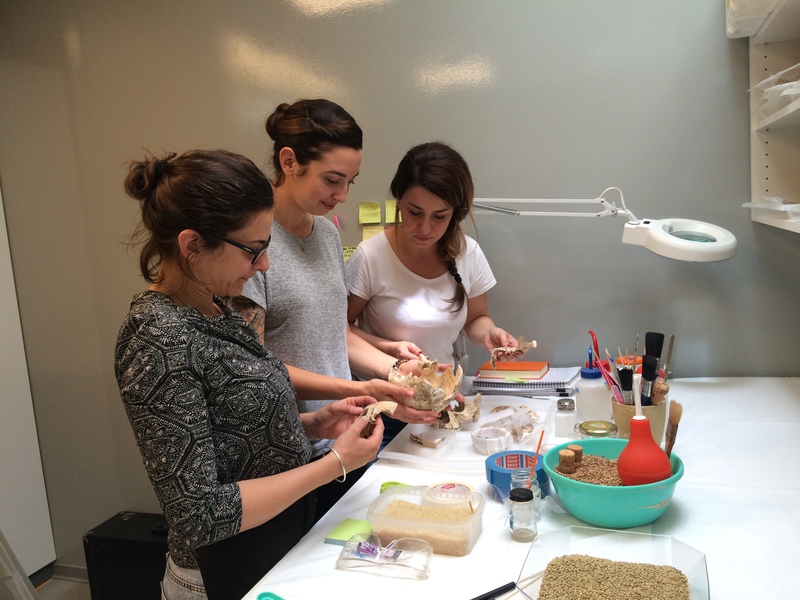 Zoe working with conservation apprentices Dimitris Kotsaptis and Spyridoula Magoula. 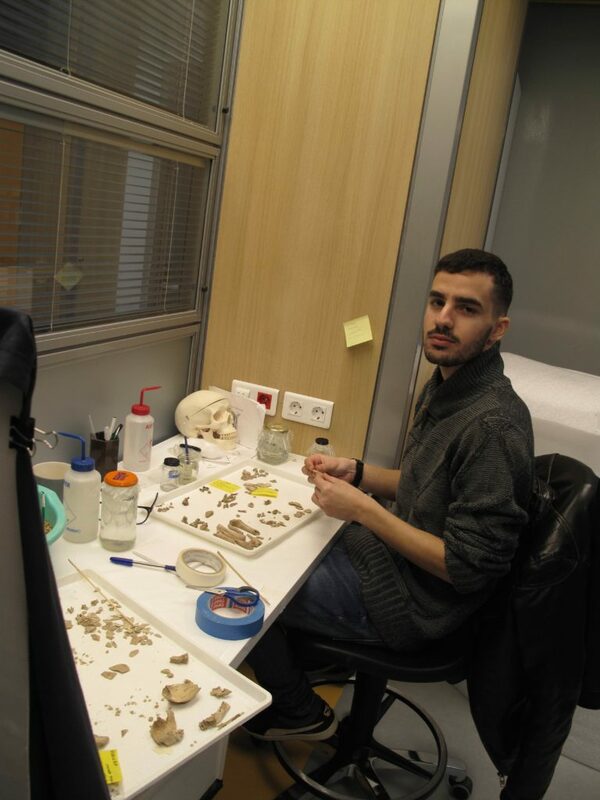 Volunteer Thomas Iossifidis, undergraduate student in archaeology at the University of Athens, is being trained in cleaning skeletal elements while learning human osteology. Thank you all for your help! U.S. 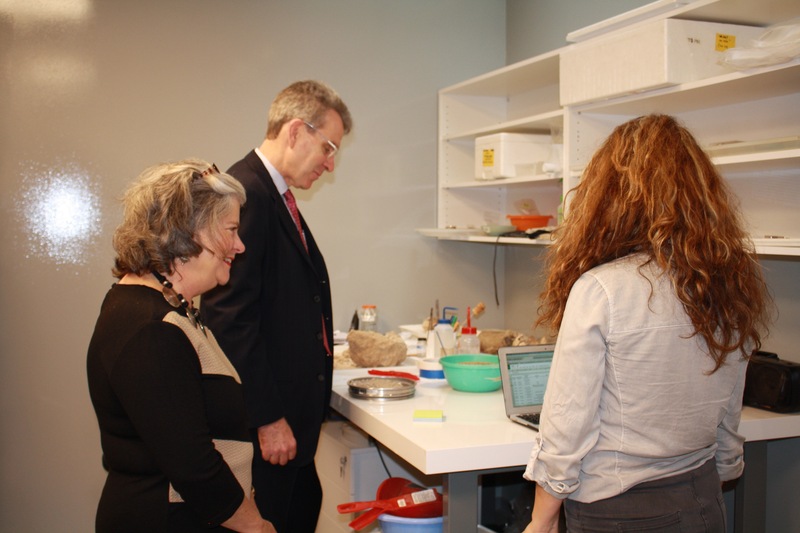 Ambassador to the Hellenic Republic Geoffrey R. Ryatt visited the Wiener Laboratory and the American School of Classical Studies at Athens. 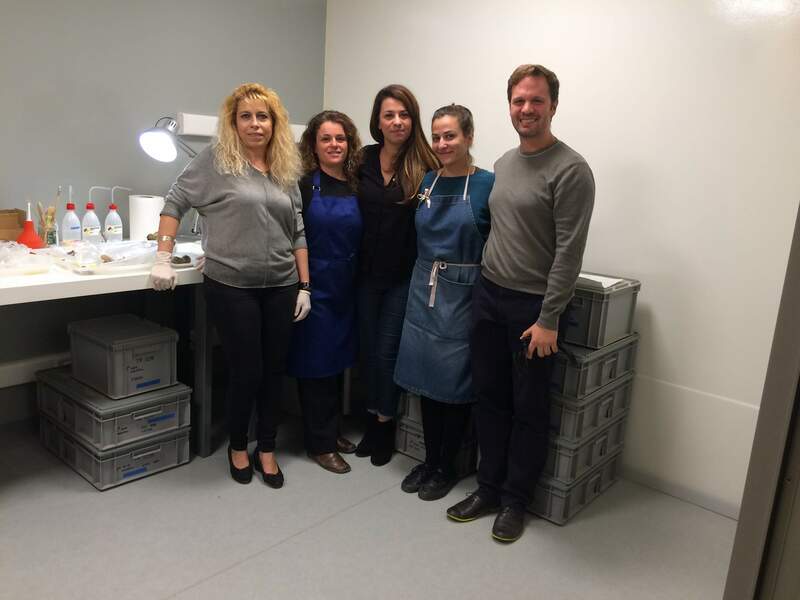 Here, at the conservation lab of the Phaleron human remains with Eleanna Prevedorou and incoming ASCSA Director Jenifer Neils. 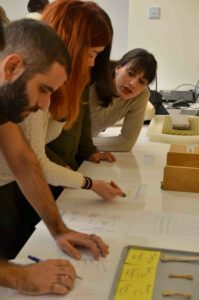 Dimitris Kotsaptis, senior at the Public Vocational Training Institute in archaeological conservation (IEK Ilioupolis), will do his 6-month practicum with us. 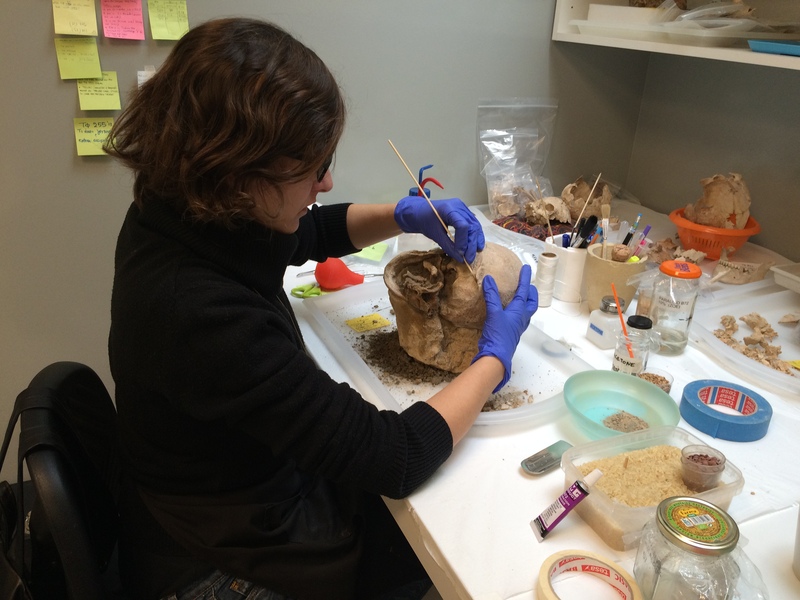 Conservator Zoe Chalatsi working on the cranium from a jar burial. 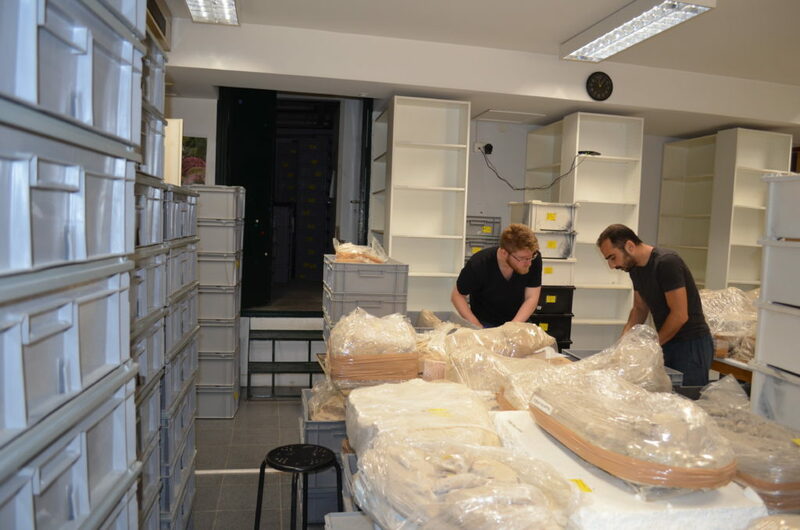 Conservator Panagiotis Papavasileiou and volunteer Dan Ehrlich organizing and inventorying hundreds of crates with human skeletal remains. 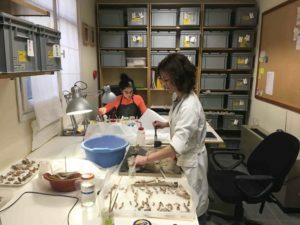 The Phaleron human skeletal remains are being transferred at the Wiener Laboratory of the American School of Classical Studies at Athens. Here, Jane Buikstra, Melinda Zeder, and Jenifer Neils peeking in on the crates at the storage area. 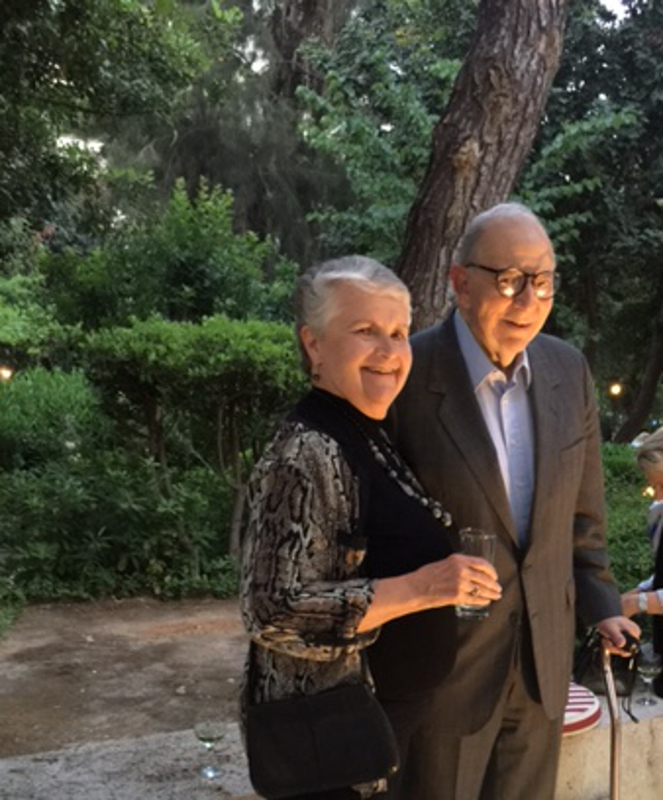 Jane Buikstra and Malcolm Wiener before the inauguration of the new building for the Malcolm H. Wiener Laboratory for Archaeological Science, American School of Classical Studies at Athens, wherein the Phaleron Bioarchaeological Project is housed. 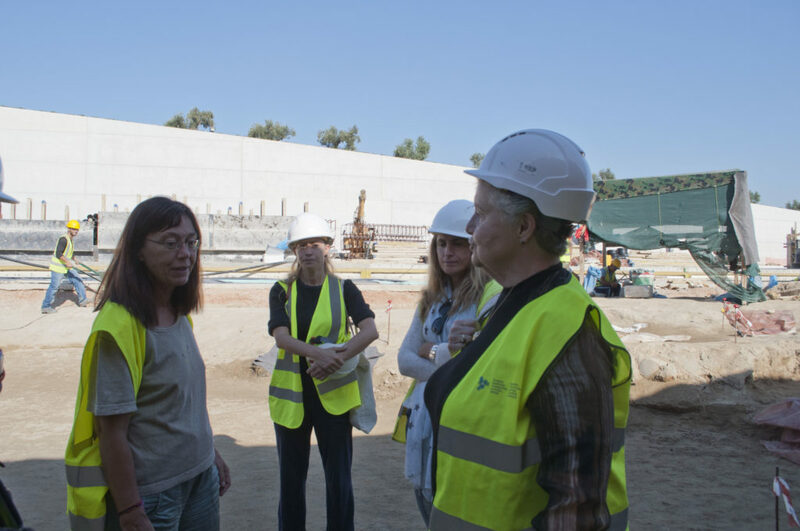 Jane Buikstra and Takis Karkanas visited the ongoing excavations at the Phaleron cemetery. Stella Chrysoulaki and Jane Buikstra during the excavation tour. 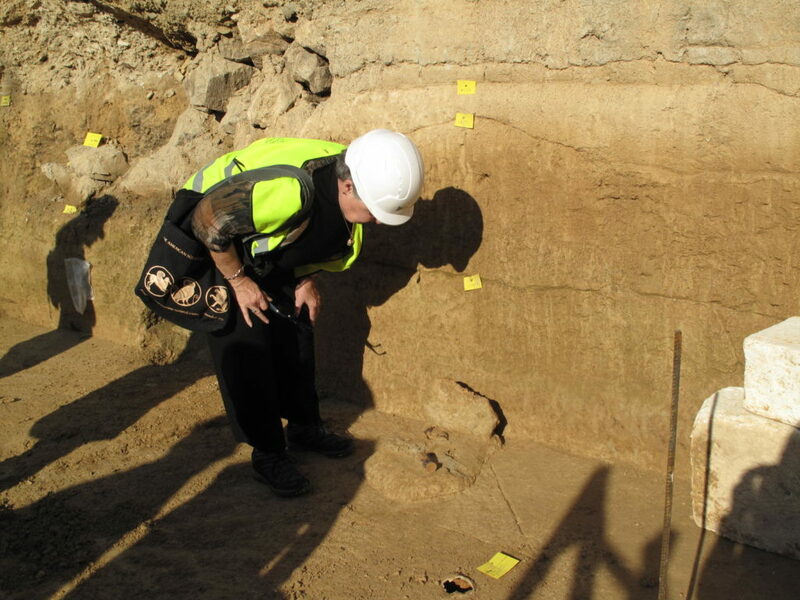 Jane Buikstra looking at an exposed burial against the stratigraphy. 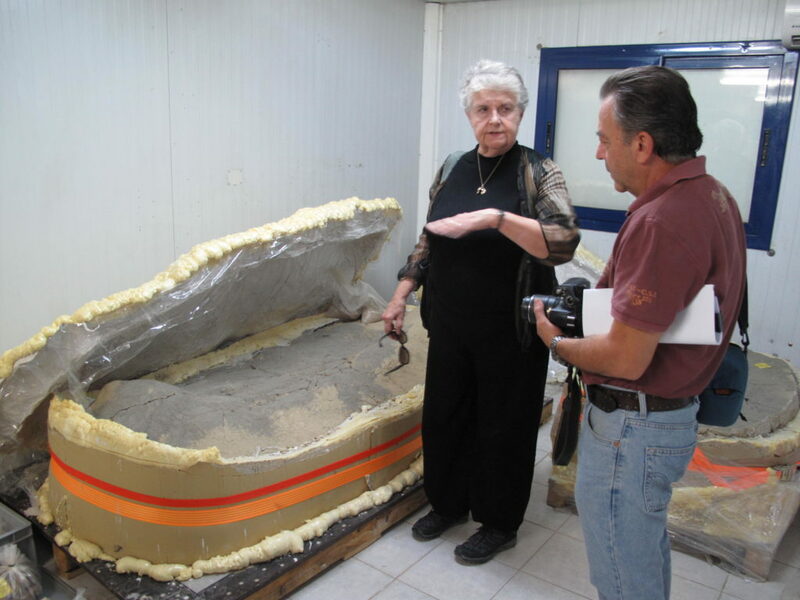 Jane Buikstra and Takis Karkanas in front of a burial removed with the “block technique” stored inside the climate controlled facility.